Cars are parked on both sides of the road. This means there is no room for motorists to pass a cyclist safely. The law says that 1.5 m is the correct passing distance. Leave at least a metre between you and any car doors that might open. Be confident and safe as you claim the lane by cycling in the middle of the road. Always signal your intension to do so. When you have the opportunity to pull in and let a car pass, you must do so but only if you can do it safely. Before writing this article I placed myself in front of Nga Purapura by the roundabout and watched several people cycling on the footpath past the Kohanga Reo and Nga Purapura. We have always done that and there used to be a sign just past Nga Purapura which indicated that it was allowed. The sign is no longer there. Stu Kilmister, Cycleways, Walkways and Bridleways Implementation Coordinator for KCDC met me at the roundabout to discuss what safety measures were needed to ensure safe passage for schoolchildren, people in mobility scooters and other people cycling and walking. Mr Kilmister agreed to investigate widening the pathway in front of Nga Purapura, after which a new shared pathway sign could be put up. However, a sign will be erected on the Tasman Road pathway directly. Cycling towards the Village on the Tasman Road shared Pathway. The safest but most difficult way to move through the roundabout in this direction is to walk across the pedestrian crossing and then across the Te Wananga O Raukawa roundabout entrance. This is tricky because traffic is fast and continuous at most times. 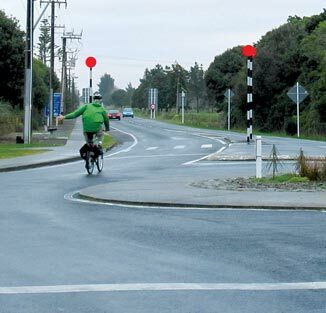 The original solution which allowed Village bound cyclists to continue past the roundabout on the footpath alongside the Kohanga Reo and Nga Purapura is safer. Cycling towards the Beach on the Tasman Road shared Pathway. Signal with your right hand that you are moving into the middle of the road a fair distance before the roundabout. Cycle fast through the roundabout while you signal with your left arm that you are entering the shared pathway. There is little hold up for motorists and as long as you show your intention by hand signals, motorists will show patience. Why be in the middle of the road? If you keep to the left motorists will seek to pass you in the narrow roundabout lane and you may get hurt.